The coalition will focus its efforts on continued development of programs with positive conservation impact, most notably the cultivation of freshwater mussels and shad, as part of an ecosystem restoration effort across the Delaware Estuary and its tributaries. 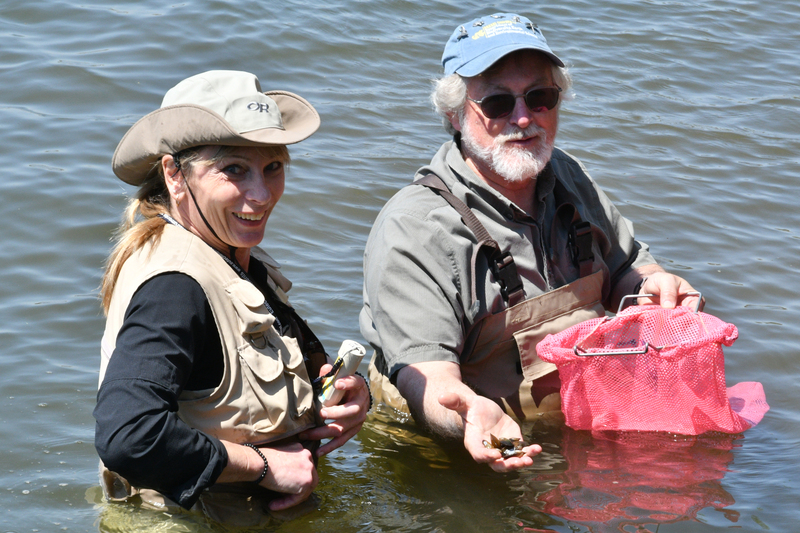 Danielle Kreeger, PhD, science director for Partnership for the Delaware Estuary, and Academy Section Leader Roger Thomas transplant juvenile freshwater mussels into the Schuylkill River. The mussels were reared at The Mussel Hatchery at Fairmount Water Works. “This is an important step in potentially developing a wide range of research and educational opportunities throughout Pennsylvania, New Jersey and Delaware, particularly those that involve the use of freshwater mussels,” Academy President and CEO Scott Cooper said at the May 1 event where the parties signed a memorandum of understanding. The Academy has a rich history studying freshwater mussels dating back to its founding in 1812. Today the collection contains 160,000 specimens with more than 250 named species, including some that are now extinct or highly endangered. “These specimens “are a priceless resource for researchers working in conservation, restoration ecology and the reconstruction of historic environmental conditions in streams and rivers,” Cooper said. This video shows a female freshwater mussel ejecting packets of glochidia, or larvae, that attach to fish, mature and then drop off in local streams and ponds. Video by Roger Thomas/ANS. Propagate and raise freshwater mussels for restoration to area streams for improving water quality, habitat, and biodiversity, and for use as native “indicators” for measuring stream health and pollution. One freshwater mussel filters and cleans up to 10-20 gallons of water each day. Propagate and raise shad (and potentially, other fish species) for restoration to the Delaware River and area streams for improving habitat and biodiversity, as well as to provide recreational and economic opportunities. Provide experiential learning and laboratory research for students—from elementary through post-graduate level—that could potentially lead to careers in the sciences and engineering for students in underserved communities. For more information about the importance of mussels to local water bodies, visit our partner at Partnership for the Delaware Estuary. Also check out The Mussel Hatchery at Fairmount Waterworks. Interested in mussels/ clams in Pennypack Creek, N. E. Phila. In 1960’s found many mussel shells along gravel-drifts of creek. Not many years later these were very rare, but began to find Asian clam shells, which I had never seen before. Through 1970’s these were common in creek E. of dam on creek at Roosevelt Blvd. then became common in creek upstream from there through 1980’s and on . Mussel shells found, very “pearly” interior, shape like Margaritifera, but could be similar species ? eneough for trout-stocking…no, or very few mussels? What was host-fish for mussels? Do the Asian clams require a host-fish? Any comments will be welcome, as I write Nature articles for Friends of Pennypack Park newsletter, and most people are not aware of this aspect of our creek’s aquatic life. (We are a volunteer group, dedicated to caring for this park. ).